Home is a place of Zen, be it small or big. But, decorating a small room poses unique challenges for every designer. Please use the tips provided below to make the best of what is available. For more understanding pictures have been provided in each point to elaborate. 1. Small Furnitures - A living room isn't always about life size sofas and tables. Pick out furniture smaller in size and antique in its look. It not only adds more space to the house but always provides a richer look. Also Love Seats are a great alternative to huge sofas. When it comes to positioning try to keep the love seats towards the edges of the walls with no windows and place the chairs around a small tea table. Pick up a tea table which is can be used not only as a table but also to store other stuff like newspapers, preferably a closed one to have a neat finish. Clockwise: Antique brown chair, blue chair, a red one and finally a simple love seat. 2. Bedroom - Firstly see how the room is positioned to find which places can be covered with decoration and where the bed needs to be placed. Secondly try to utilise all the nook and corners to completely. Also use one simple lamp at either one of the corners. Use floating shelves to increase the bedroom square footage. Paint a bold colour to make the room look bright and cheerful. When it comes to the bed try to make it multi functional where additional space can be acquired by backrest storage or under the bed storage rather than having separate racks. For kids try using a bed bunk alternative saves a lot of space, also a built in table along with the cupboards will work. A simple lamp above the bed utilised as a book shelf as well, with subtle and calm paintings. A kid’s room with an inbuilt study along with the cupboard in a dark colour shade of purple and black with wooden flooring. A double bunker bed which slides out for small rooms with limited space. 3. Kitchen - An area where families are most often gathered to talk and cook needs to have sufficient space. Try to combine the walkway, dinning and the kitchen together. The division between the dining room and kitchen can be added with a slab to utilise for dinning. A built in banquette also is an added advantage for more space. A smaller house can have the kitchen and living room shared with a mesh separating the two. If more storage space is required try to use built in storages in walls by adding shelves. Clockwise: A kitchen with one slab for both the purpose of dining table and a separating from the living room, a built in banquette and finally a kitchen with the walkway, kitchen and dinning combined. Mesh separating the living room and the kitchen. 4. 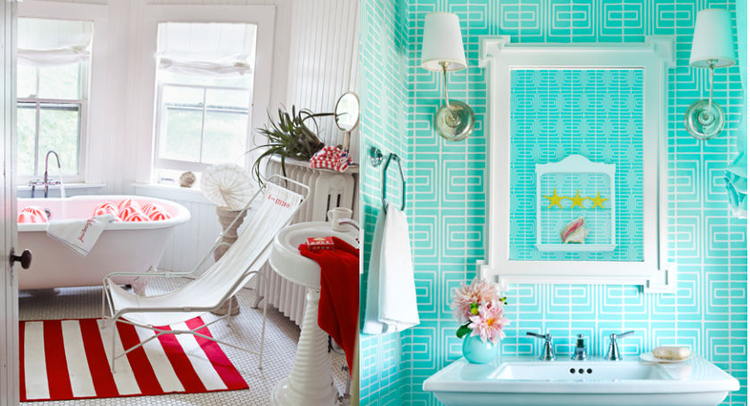 Small Bathrooms - A bold and bright coloured geometric design. Try using just one face mirror and design the cupboards and shelves with mirrors which can provide a reflection and make it look bigger and brighter. Smaller sinks are more efficient, in some cases the sinks has been kept outside the entrance of the bathroom. A lot of Gray shades add a more soothing effect. For a nostalgic look try white and black combination. If the room has high raised rooftops then try adding windows towards the top to add more light and make it seem more airy. Furthermore the shower and bathtub can be combined together. On the left: A bathroom with combined shower, bathtub, a small mirror and a simple sink. On the right: A geometric bright coloured bathroom with a mirror enclosing a shelf. 5. Balconies - Lastly if there is a balcony attached with the kitchen, bedroom or the living room you can always extend the room for additional space. A balcony with glass walls, huge windows makes the room look wider and larger. It could also be reconstructed to be used as a study area or it could be made into a work from home area. If plants are on your mind, yes of course you can add more vibe to the room by adding the right type of plants and using light vibrant colour flowers, chairs and small tables to sum it up. Clockwise: A balcony attached with kitchen modified with a dining table, an extended room space from the balcony, a work from home area, a balcony with tables and plants and finally a study table modified out of a balcony.